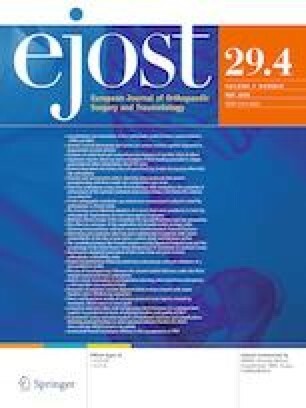 Stem length in primary cementless total hip arthroplasty: Does it make a difference in bone remodeling? Stem design is usually accused for proximal femoral remodeling following total hip arthroplasty (THA). The aim of this prospective study was to compare the in vivo changes in bone mineral density (BMD) of the proximal femur after implantation of cementless THA with two length alternative stems. Between May 2011 and March 2014, 50 patients, who met our selection criteria and received cementless THA, randomized into two groups. Group A received cementless standard femoral stems, while group B received short stems. Harris Hip Score (HHS) and visual analog scale (VAS) were used for clinical assessment. Stem and cup positions and stability were radiologically evaluated. Dual-energy X-ray absorptiometry was used to follow and compare changes in BMD in different zones of proximal femur between both groups. After a mean follow-up of 21.4 ± 3.53 months, there was a significant (p < 0.05) improvement in mean HHS and VAS with no significant differences (p > 0.05) between groups. There was no significant difference (p > 0.05) between groups regarding radiological results and rates of complications. The mean overall BMD was decreased by 11.26% for group A and 8.68% for group B at the final follow-up (p > 0.05). The greatest loss was found in greater trochanter region for group A and so for group B, but to a lesser extent (p < 0.05). Cementless short stem was not able to hold back proximal femoral bone loss, but only can modify or decrease its incidence within limits.